Thank you to the many donors who have continued to support the Surmang shedra and the other activities of the Konchok Foundation, even during these difficult economic times. Your contributions make these efforts possible. Tibet. Many events took place this year affecting Tibet, including the Beijing Olympics and demonstrations in Lhasa and elsewhere. 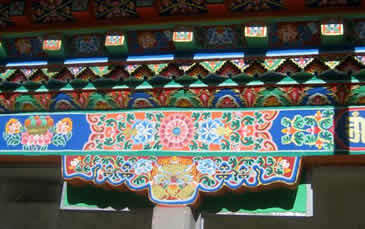 One of the results was a significant slowdown in construction throughout Tibet, including Surmang. The calamitous Sichuan earthquake was far distant from Surmang and could not be felt there. However, those construction workers at the site who are Han Chinese are mostly from Sichuan and they needed time to attend to their families, also slowing down work. Surmang Shedra. Ten people were still working on the shedra construction in late October, however, winter has now arrived at Surmang. Heavy snow and subfreezing temperatures have brought even the indoor construction to a close for the season. Despite the disruptions to the planned construction schedule for this year, several major tasks were accomplished. All of the windows in the shedra complex have now been installed, most of which are open-able. Western-style double glazed windows are not practical there so an insulating effect has been accomplished by using double layers of windows. Structural masonry work is essentially complete but decorative masonry work continues. A large amount of exterior stucco work was done this year. The insulation work on the complex—itself quite a large job—is now complete and the majority of the interior plaster work has been done. An underground water line from Chakrasamvara creek to the shedra was laid, although the water tank itself hasn’t been built yet. The solar electric station built by the Chinese government below the shedra, which the shedra helped to pay for, is operational. There are now electric lights in the Surmang monastery (!) and in the monks’ houses. Wiring has been installed at the shedra but won’t be hooked up until later. The Surmang Khenpo, who is the direct supervisor of the construction, is in the U.S. for now. He is in continually active contact by cell phone with people at Surmang. Sponsor a mandala! Approximately twenty-five large mandalas are being painted on canvas-like fabric for installation on the ceiling of the main shrine room. The sizes range from roughly 7 feet by 7 feet to 13 feet by 13 feet. The mandalas include Chakrasamvara, Vajrayogini, Kalachakra, Guhyagarbha, Hevajra, a mandala of sangha gathering, wrathful deities, peaceful deities, and others. The average cost of a mandala is $500. Would you like to sponsor all or part of a mandala? 1/10 of a mandala is $50, 1/5 is $100, 1/2 is $250 and a full mandala is $500. Please let us know when you make a donation if it is for mandala sponsorship. Children’s education in the Surmang valley. Thanks to a special grant, an educational program directed at local children will be starting up prior to year-end. The Surmang Khenpo is working with Aten (Chetsang) Rinpoche, one of the Surmang tulkus, to oversee this program. Trungpa XII Rinpoche is studying at Serta in eastern Tibet, where he has spent the past few months. Konchok Foundation continues to provide support for his living expenses. Monks on retreat. As in prior years, support was provided through Konchok Foundation for monks on retreat at Surmang. Wayen monastery. Support provided through Konchok Foundation is presently helping to build a water project and some retreat cabins. Wayen, in Golok, is closely associated with Mipham Rinpoche. Financial status. A great deal of finishing, and furnishing, work still must be done on the shedra before it will be ready for occupancy. Meanwhile, construction costs have continued to escalate rapidly in all areas of China. Roughly $350,000 is still needed in order to properly finish the shedra (not including the solar heating collectors). Thanks to Sakyong Mipham Rinpoche’s Napa Marathon, the spring fundraising campaign for Surmang was successful. However, the fall campaign, which is normally a crucial support for the shedra, was postponed because of the financial market chaos. The fall campaign is now being combined with our usual year-end request for support. We realize that this is a difficult time, financially, for many people. However, there is no way to finish the shedra and have it open for use without your continuing support. People at Surmang, where the average cash income is less than $200/year, don’t have the resources to complete this project. Any help you can provide, even if it is less than what you’ve been able to do in the past, is crucial.